Finally, Samsung flip-phone fans get an official unveil date of the long-awaited W2019. The W-phones are flagship flip-phones for the South Korean electronics company and while the availability of these phones is usually limited to China and Korea, the official word from Samsung is that the W2019 will be released on November 9th with hopes of it being released elsewhere in the world before the year ends. According to the latest news about the specs of the W2019, this Samsung phone should feature a USB-C port, a Bixby button, no headphone jack, a Galaxy S10-like dual-camera setup, two 4.2-inch Super AMOLED displays, a Snapdragon 845 chip with 6GB of RAM and a 3,000mAh battery. The launch will be a China exclusive event held on November 9th but we already know that the price shouldn’t be less than $2,000. 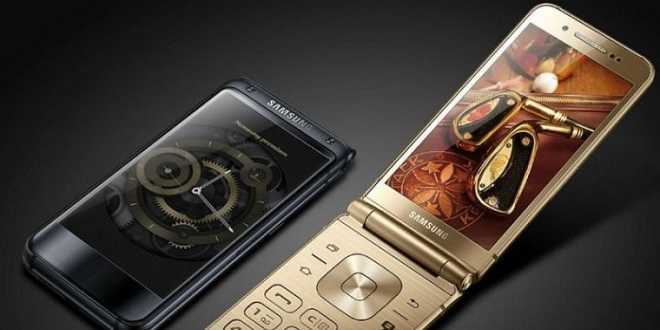 Plus, given the invitation, the W2019 flip-phone should come in a red and blue version along with the rose gold that’s been leaked already on the Internet. Make sure you’re on Santa’s Naughty or Nice List! November is a time for getting ready: preparing yourself for turkey day, for untangling your twinkling lights and for making sure you’re on Santa’s Naughty or Nice List! Deposit as low as $25 and you’ll be filling your account with early holiday cheer and a 225% Bonus + 50 Free Naughty or Nice Spins! There’s still time! Santa will be checking his list twice, so you still have a chance to behave – or misbehave! Take a break from being good or mischievous as you spin the reels for free while waiting for the release of Naughty or Nice III on November 21st! Offer available once per day throughout the month. It holds 30x slots or keno playthrough and NO MAX CASHOUT! Halloween is a time for trick-or-treating and wearing costumes to pretend we’re someone else for just one night. It’s also the perfect season to revisit horror’s most feared villains. Who’s your favorite Hollywood fiend that still haunts you in your dreams? Who doesn’t remember the flesh-eating wrongdoer that could outsmart us all? Lecter is a methodical villain, unlike your everyday cliché image of an evil guy with an axe. This guy kill and then eats his victims – talk about scary! Every kid loves a happy clown – Halloween or not. But what if this friendly clown suddenly turns into your worst nightmare? 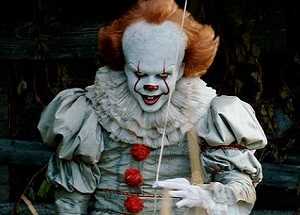 Pennywise likes to spend his time in the sewer and preys on children's fears. So, you better not show your face in the gutters! What’s the most delicious time of the day? When we finally get to sleep. 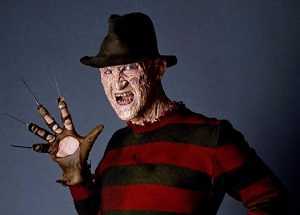 But wait, not when Freddy Kruger shows his face. This villain likes to get in your head and inside your dreams until he finally gets you. This Halloween you better not fall asleep, or you’ll be meeting face to face with this red and green striped sweater monster. 400% Halloween Bonus up to $1,000 + 40 Free Spins on Voodoo Magic on Top! Promo requires a $35 min. deposit and it holds 40x slots or keno playthrough + 10x roll over on spins winnings. Trial Spins hold $200 max cashout. Game: Witch's Brew. Both offers are valid until tomorrow, October 31st! November is Time For Slots Giving! We’re so much closer to the holiday season that we’d thought we set the table with a 150% 1st Slots Giving Bonus, a 200% 2nd Match Bonus and for dessert, a $100 Free Slots Gift! Continue with a 200% 2nd Match Bonus! Claim after a $100 Free Slots Gift! Deposit offers require a $25 minimum deposit and they hold 30x slots or keno playthrough and no max cashout. $100 Free Chip holds 40x roll over on slots or keno and $500 max cashout. Promotions must be redeemed in order! Valid until November 30th. Here’s a plot twist to the zombie stories you’ve heard. This new 5-reel slot deals with Chinese Zombies –half-living beings with mad martial art skills! Wild symbol: The I, Zombie icon substitutes for all other symbols except scatters. It will expand randomly on some spins. Scatters: The Mirror icon serves as scatter and trigger for the Free Games below. The Mirror icon can also generated expanding Wild Symbols on its reel. Free Games: Earn Free Games when three or more scatters appear anywhere on a spin. 2 Free Games are awarded for EACH I, Zombie and Mirror scatter in the triggering spin. Both the wild and scatter symbols will expand to generate extra wild symbols on a free game! If 4 scatters triggered the feature, all prizes are doubled. If 5 scatters triggered the round, then all prizes are tripled! Throw yourself into the battle against wild Chinese Zombies and experience mortal joy as you win endless jackpots! 111% Match + 111 I,Zombie Spins on Top! Witches vs Zombies Free Spins Pack! Visit Us For All-Ways-Pays Bonus Fishing! Trust Uptown’s Favorite Witches this October!